4.5″ closed. 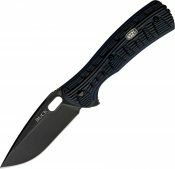 3.5″ stonewash finish 4116 stainless drop point blade. Green textured FRN handle. Thumb stud. Lanyard hole. Pocket clip. Boxed.